With an idea to beautify your home, you initiate your search for the best contractor within your reach. It’s really a hectic task to opt the one which encompasses all the requirements we need from our end. If executed wisely, you can get rid of this task and score an impressive interior home design. So, below we have collected the major points that need to be considered while appointing a contractor to initiate your interior home decor. Prefer Quality over Perfection: It’s obvious that whenever you hire a contractor, you expect perfection from his/her end. But it is highly advised that instead of focusing on the perfection, prefer quality service. Your quality will retain for a longer time in comparison to the perfect task which may live for a lesser duration. After all, the concerned person is also a human, not a perfectionist. Lookout Previous Works: Every person has their portfolio to show their skills and talent. 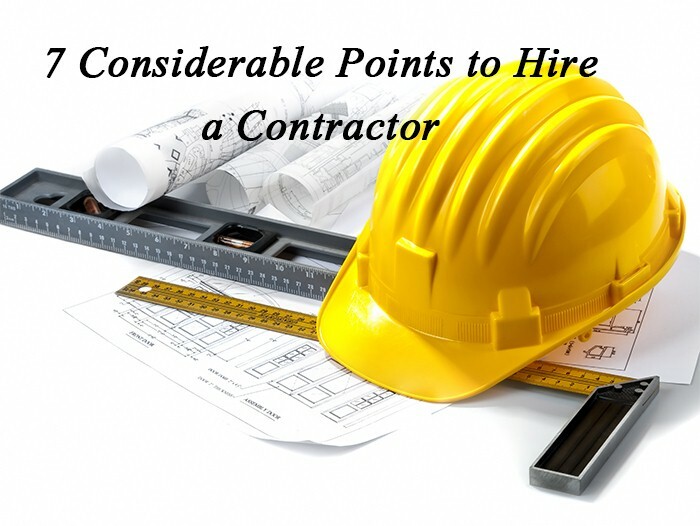 The same is to be followed when it comes to hiring a contractor. Ask for the earlier works done by the person and look out the same. From them, you can analyze that whether the concerned person is capable enough to bestow your demands or not. Consider the Contractors Judgments: Soon after entering the work area, your contractor will start observing your layouts and past décor patterns. In reply to that (s)he will begin offering judgments on how you can get even better than what you are presenting planning. So, consider their suggestions and implement according to your budget, your requirements and other few essential factors. If you think the offered suggestions are better and are easy to implement without affecting your pocket, you can overlap your prior interior design ideas with the new one. Feel free to Negotiate: Negotiation is what every person finds the best option to save a few bucks. After allowing the contractor to visit the working arena and develop his strategy, start the negotiation process. But always keep in mind that doesn’t expect unpredictable rates, which the contractor can’t bestow you anyhow. Ask for his/her price and then negotiate for the one you find reasonable. With a healthy and face to face discussion, you will not only conclude on a friendly costing for your home décor. Keep Everything in Writing: By day first to last, keep track of all the talks and negotiations between you and the contractor in written format. You can even put the signature of both parties on time to time basis. This will help you to track all the verbal or non-verbal commitments. Also, you will have a written proof of all your talks. For convenience, you can add the payment schedule, time span required for the complete project, after work warranty and any sort of assistance. Follow Safety Norms: Every task has some Do’s and Don’ts. So, before finalizing the formalities, ask for the same. This majorly includes the security and safety precautions that need to be taken care of. Either it is ahead of the implementation plan or to be done after the completion, you must note them down and follow them.